Over the years I have picked up Natasha Solomons novels and always enjoyed the stories that she has had to tell. This one was no different, although I have had it languishing on my kindle and on netgalley for far too long. The Goldbaums have a place in society, tolerated because of their wealth. They are respected by governments across Europe, because of their wealth. If you are a male Goldbaum then banking is your business whether you choose it or not. If you are a female Goldbaum then your business is to be a Goldbaum wife and mother. The Goldbaum’s are the dynasty that spreads across Europe with power and influence. That is until war comes. The Great War. This powerful position is played throughout the novel and I learnt a lot about how such power and wealth comes to play in war. An angle I had never considered in such depth before, but one I could see very clearly now. Though I put that down to my age and knowledge of events that have gone past since The Great War. The story though is ultimately about Greta and how despite being a Goldbaum from one branch and having to marry into another branch is fiercely independent and determined to make her mark and not be overlooked in any way. Her actions and challenges to the norm and what is ‘expected’ were both heartwarming and heartbreaking. She can be found naked under the cherry tree in the early days of marriage, she will breastfeed her son herself. She will understand the power and knowledge that women can have in a man’s world. She will love and she will grieve, for everything she knows about her Goldbaum history will be torn apart by war and the greed of money. 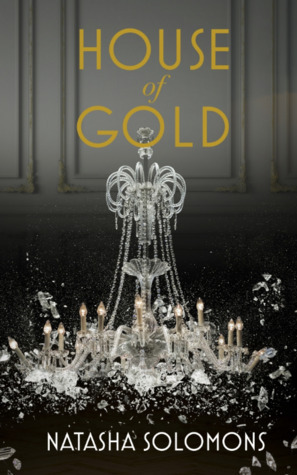 A really interesting novel, and whilst I found it rather slow in parts, the business of gold and war bonds did sometimes detract from the story too much. I knew it was based in part on some sort of truth, the family really portrayed is similar to the Rothschild’s. The strong sense of anti-Semitism was clear, although I think history was manipulated a bit to bring the point across. The impact though can be felt by the reader. A historical novel worthy of reading, to bring another aspect to many of the novels which feature The Great War. Thank you to the publisher via netgalley for the opportunity to read this book. The House of Gold is out now.